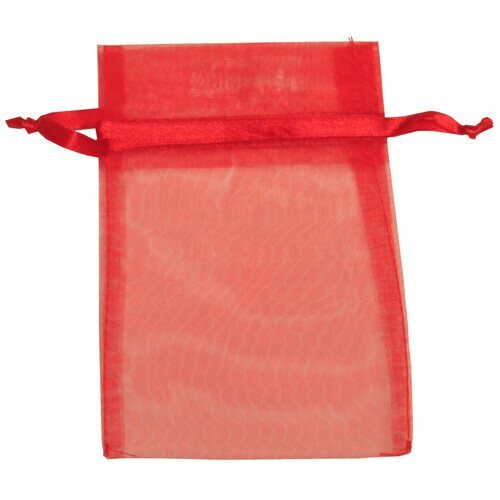 Dress up your party favors with our Red Sheer Organza Bags! When you want your items to be seen immediately, but given a little more spice, organza is a great alternative to the opaque gift bags. Red is the color of passion and strength, so when you combine that with your small gift, your present is good to go. From cookies to candy to candles to jewelry, these organza bags will match any kind of item. And you don't want to forget about our wine bag size, able to fit any standard wine bottle! Each bag comes with a convenient yet stylish drawstring fastener. Each string matches perfectly with the red sheer material! All you need to do to wrap this up securely is pull the ends of the string! It's as simple as that. Easy to open too!